How do you capture moments worth keeping? As the smallest 3-axis stabilized handheld camera DJI has ever designed, the compact and intelligent Osmo Pocket turns any moment into a cinematic memory. In just seconds, Osmo Pocket lets you share your life anywhere, anytime. 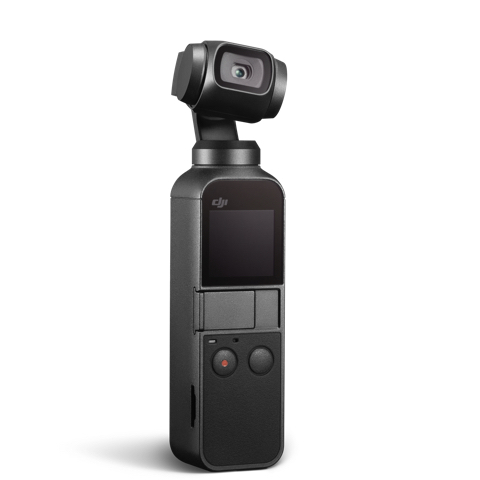 Osmo Pocket uses DJI's smallest 3-axis mechanical handheld gimbal. In real time, it precisely adjusts for your movements, turning your handheld video of a golden sunset or your child’s first steps into a movie-like scene. Osmo Pocket transforms all your life’s moments into wonderful images. It snaps photos in stunning detail, thanks to a 1/2.3-inch sensor, 80° FOV, and f/2.0 aperture. It can also shoot 4K/60fps video at 100 Mbps, slow motion video at 1080p/120fps 4x, and photos at 12 MP with a pixel size of 1.55 μm for footage worth sharing every time. Osmo Pocket boldly embodies the DJI approach to modern technology. The candy bar-sized device was made to be as convenient as your smartphone, wallet, and other daily essentials to offer everything you need for shake-free footage in any situation. Our engineers developed a micro-scale manufacturing process to achieve the smallest 3-axis gimbal in DJI history. This miniaturized mechanical stabilization platform and brushless motor always deliver fine-tuned gimbal control accuracy. For perfectly quiet performance, Osmo Pocket takes advantage of a fanless, passive cooling solution that dissipates heat evenly, ensuring longevity and consistent performance. A sandstone handle is non-slip and sweat-proof, offering a comfortable grip. The built-in touchscreen and buttons provide a quick, single-handed user experience, letting you choose modes and adjust settings in a few swipes and taps. Osmo Pocket includes a Universal Port – the door to further creativity. This multifunctional expansion interface connects Osmo Pocket to your smartphone, as well as an ever-growing suite of accessories that sets you free to film in any way. Osmo Pocket doesn't just let you shoot smooth, cinematic footage. With access to several intelligent functions like ActiveTrack, Motionlapse, and 3x3 Panorama, Osmo Pocket unleashes your creativity with impressive effects that are impossible with smartphones. Recreate the action from your perspective. FPV mode follows the gimbal's orientation to film thrilling action shots with smooth results. Just tap on a subject, and ActiveTrack intelligently follows. Entering Selfie mode automatically launches FaceTrack, keeping you in the center of the picture. To squeeze a beautiful day into a single shot, Timelapse turns hours into seconds, and Motionlapse adds smooth camera movement for dramatic effect. Osmo Pocket automatically detects and illuminates low-lit scenes, resulting in brighter photos. You can also take tripod-free, 2-3s handheld long exposure shots in Pro mode. Story mode uses a combination of preset shooting patterns and camera motions to help you create professional-quality video whenever you want. Exclusively-designed filters and soundtracks give a unique finish to your footage. DJI Mimo is the companion to let you shoot, edit, and share amazing moments. Osmo Pocket enhances the photography experience with intuitive functions and allows total customization. Pro mode lets you manually adjust camera parameters like exposure, ISO, and shutter speed. Powerful imaging capabilities also capture RAW format photos and D-Cinelike videos, retaining rich detail and allowing more room for post-processing. DJI Mimo was designed for all types of users to enhance their content with a professional touch. My Story lets you set the tone of your video with templates, filters, music, and watermark stickers in a single tap. A suite of accessories perfect for Osmo Pocket offers even more options for filming and photography, helping you make unforgettable footage. Stores and charges Osmo Pocket, with dedicated space for two microSD cards, four ND filters, and two smartphone connectors. Provides a Bluetooth and Wi-Fi connection between Osmo Pocket and your smartphone for seamless remote control and transmission. Features an expandable length, gimbal control stick, operation buttons on the handle, and 1/4" tripod mount. Allows use of Osmo Pocket at depths of up to 60m for smooth underwater shots, detailed close-ups, and clear low-light detail. Provides compatibility with a wide range of sports camera accessories to use Osmo Pocket for sports and action-based scenarios. Reduces the amount of light entering the sensor, enabling more control of camera settings in any lighting condition. Equipped with a dial for precise pan & tilt control, as well as two operation buttons for improved shooting composition. Allows the use of a dedicated external microphone for maximizing sound quality in a variety of situations. Provides full protection for Osmo Pocket, allowing for quick, safe storage on the go. The Smartphone Adapter (Lightning, USB-C) allows you to connect your smartphone to the Osmo Pocket and use DJI Mimo App to experience more. Uses a twist-lock design to attach to the Accessory Mount, with an industrial adhesive strip for a firm hold to a helmet, board, and other surfaces. 1. Tested without a connection to a phone or accessories. 2. Panoramas must be viewed on the DJI Mimo App. 3. Story mode and D-Cinelike video will be available soon in a future app update.